Without question, one of the fastest-growing segments of the market has to do with computer audio and music-server devices. At High End 2011, Austria’s Pro-Ject Audio Systems showed the new Stream Box SE, which retails for 700€ and has a wealth of features including support for 24-bit/192kHz playback and high-resolution USB. What’s kind of ironic about Pro-Ject offering such an innovative device is that the company is best known for turntables! Do USB and FireWire cables make a difference? In this video, SoundStage! Network publisher Doug Schneider talks to AudioQuest's director of marketing, Steve Silberman, about the performance benefits that can come from using high-quality USB and FireWire cables that, in the case of AudioQuest, range in price from $30 to $650. The SoundStage! Network has produced videos at shows such as High End for approximately three years; however, this is the first video shot, edited, and published at an event, another milestone in our long history of producing cutting-edge, on-the-spot coverage. 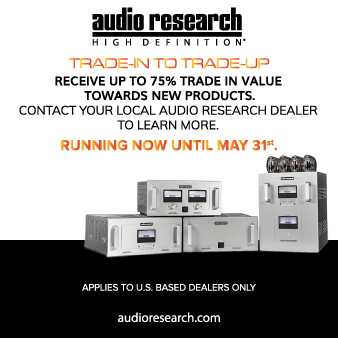 Three preamplifiers, six power amplifiers, two integrated amps, two CD players, four loudspeaker models, a complete line of cables, power distribution, phono stages, spikes and demagnetization devices, and even racks as well as furniture. Gryphon Audio Designs of Denmark can assemble a number of complete audio systems using only their components. Although the breadth of their offerings is large, what's most impressive is the high quality with which they do it all. What's more, it's all designed and built in Denmark to world-class standards and then sold worldwide. Previously, I wrote about three lavish stand-mounted speakers that I described as "sinfully sensational." I called them sinful because of how expensive they are, and I called them sensational because they're so darn cool. But being sensational isn't limited to expensive products; ironically, the product that caught my eye today is one of the cheapest I've seen at this show: the tricked-out NuForce uDAC-2. From comments that I hear, I'm led to believe that many people think two things about me: 1) I favor mostly two-way, stand-mounted (i.e., bookshelf) speakers, and 2) I like only cheap stuff. There was a time, in the not-too-distant past, when small speaker companies could not compete in specific aspects of loudspeaker design with large speaker companies. For instance, even five years ago it was almost impossible to find a specialist high-end speaker manufacturer that designed its own drive units. When I say "design," I don’t mean using modified drivers (or ordering custom drivers to spec or having a name stamped on the chassis by the OEM), I mean drivers engineered from the ground up by the company for the company. That's not to say that good results can’t be had having someone else do that work. But wouldn’t a company always be limited, to even a small degree, because they aren’t in complete control of their project? With recent advances in computer simulation software along with some highly specialized in-house engineering, a number of small companies are now operating on a world-class level in every aspect of the design process, including driver design. High-end speaker making has officially graduated from its hobbyist roots. I just love loudspeakers, so something like KEF's new Blade speaker really charges me up. It's not just because the speaker looks nice or sounds great or is brand new; it's because KEF has forged ahead and made what I feel are real advancements in loudspeaker design. Audiophiles tend to have a love-hate relationship with so-called "digital" amps. These switching-type designs can deliver extremely high power and very good sound, quite often for a reasonable cost. However, few will tell you that these modern amplifier devices are flat-out better-sounding than a cost-no-object conventional solid-state or tube design. For me, nothing rivals the sound of a pure-class-A solid-state amp no matter how ludicrously large, heavy, and hot it might be. What would you say if I told you that the state of the art in loudspeakers can be purchased for half, or even a quarter, of the price you might think? Not really good speakers. Not almost-the-best-you-can-buy speakers. But state-of-the-art speakers. As in better than what was available just a few years ago at crazy six-figure prices! Would you be surprised? Excited?